European-style tapestries are large decorative wall hangings woven by hand in a tapestry weave. The word “tapestry” actually refers to the weaving technique, not a particular type of textile. In order to hang properly, tapestries need a Velcro hanging system and proper lining. Before they can be hung they usually need cleaning, structural repairs such as tabby reweaving in areas of weft loss, and closing of slits between color fields. Museum Textile Services is a unique tapestry conservation facility, combining superior hand skills and a deep research background. Installing a tapestry in the Burnes Library, Boston College. Many other historic textiles are made in tapestry weave including Navajo rugs, kilims, Chinese kesi, Kente cloth, and many Coptic and pre-Columbian textiles. Our tapestry conservation skills apply to to large and small tapestries alike. Detail of a Cretan embroidered tapestry, c 1950. Courtesy Wheaton College. Detail of a Chinese kesi, c 1780. Courtesy Wadsworth Atheneum. 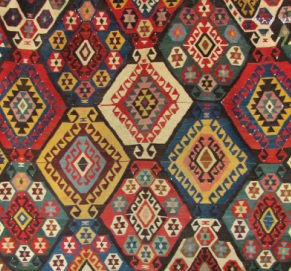 Detail of an Anatolian kilim, ca. 1950. Courtesy private collector.